Traditionally, the ukulele is an acoustic instrument that generates its own sound. Recently though, electric ukuleles have been making an emergence as a popular choice for ukulele players. For a ukulele to be compatible with an amplifier, it must have a pickup installed in it to transmit the sound to the amplifier. Some acoustic ukuleles have a pickup installed which will allow you to use it as either acoustic or electric, while other ukuleles are purely for electric use. It’s also possible to install a pickup into an existing acoustic ukulele, but that involves cutting into your ukulele so it’s not for the faint of heart. Electric ukuleles are similar to electric guitars in that they require a powered amplifier in order to generate much sound. The cool thing about electric ukes is they can produce a range of sound that a normal ukulele cannot. As you can hear above, an electric ukulele can add a really cool dynamic to your arsenal of sounds! The primary feature of an amplifier is to use a speaker to project your ukulele’s sound, which all of our selected amps do! The volume of the amp is adjusted via a knob on the unit. Other features of amplifiers include equalizer adjustments which help you distort or fine-tune the sound of the amplifier. This can be useful to help you getting a desired sound for a specific song. Many of these amplifiers also have a headphone output port that will let you listen to your music only through the headphones – great for quietly practicing. 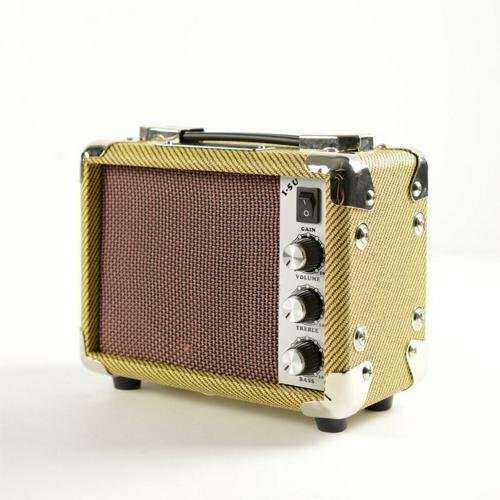 First on our list is the Kala Tweed Amp. Kala is a well known ukulele brand, so you can be certain this amplifier is made specifically to sound great with ukes. This Kala Amp provides 5 Watts of power, and can be powered by two 9-volt batteries. No power cable or outlet is required though an AC adapter is included if you wish to use that instead of batteries. The entire unit weighs less than 5 pounds, so you can easily transport it. 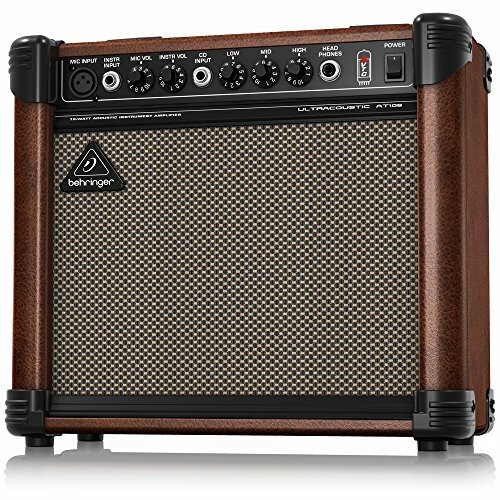 Being a small amplifier, you probably want something bigger and louder if you plan on putting on a performance, but this amp works great for playing for a small group or for practice. If having a lot of volume from your ukulele amplifier is more important to you, keep reading to see some options with higher Wattage. Check out the Kala Amp on Amazon! When it comes to music, everyone knows Fender whether they play an instrument or not. 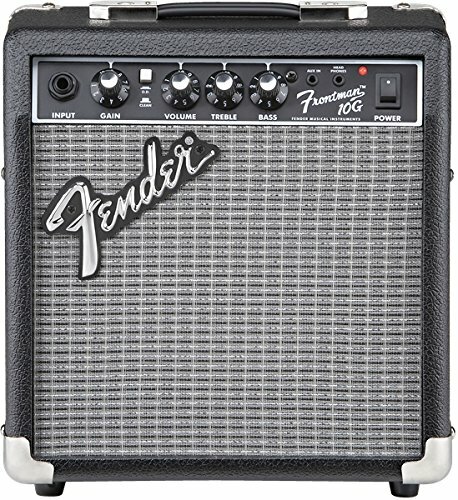 The Fender Frontman 10G is a 10-Watt amplifier with all the features you expect from a portable amp including volume/bass/treble adjustments and headphone output. This amplifier must be powered via a wall outlet, but it provides a good amount of sound for small performances. They also have a 20 Watt version if more volume is what you crave. This ukulele amp is a good choice for those on a budget, it can usually be found for around $60. 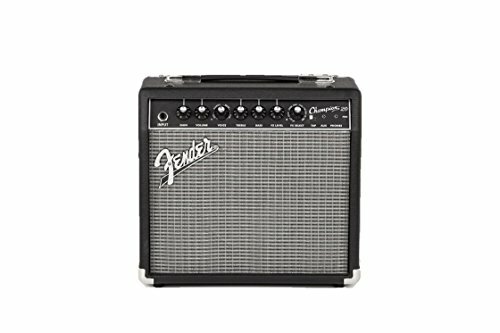 Find the Fender Frontman on Amazon! Another step up in power, the Behringer Ultracoustic AT108 is a compact amplifier that gives you inputs for both a musical instrument and a microphone. This make a good choice for the ukulele players who wants to use a mic for their singing, or simply use a mic to capture the sound from their acoustic ukulele. With 15 Watts of power and an 8″ speaker, this speaker excels at filling a small to medium sized room with high quality sound from your ukulele. If you’re looking for the ultimate control over the sound of your electric ukulele and would like to be able to play many different kinds of sounds, look no further than the Fender Champion 20 amp. This amplifier has multiple voice settings as well as special effects settings to completely customize your sound to fit your musical genre. Check out the video below to hear all of the sound effects in action. With 20 Watts of power, this amplifier should suit you for any small to medium sized performance. This unit is powered via a wall outlet and it comes with a 5 foot cable.